Hello There, Kale!Irish Mashed Potatoes with Kale (Colcannon)Kale & Bacon Breakfast Stuffed PeppersOur Kale Ebook is Out! Sub out Taco Tuesday with Taco Salad Tuesday. This salad has everything you love about tacos, and also has super-healthy kale. 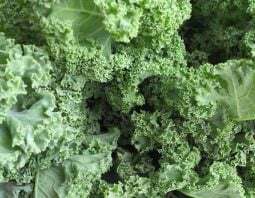 Yesterday, we showed you how to take fibrous kale and make it tender for using in salads. 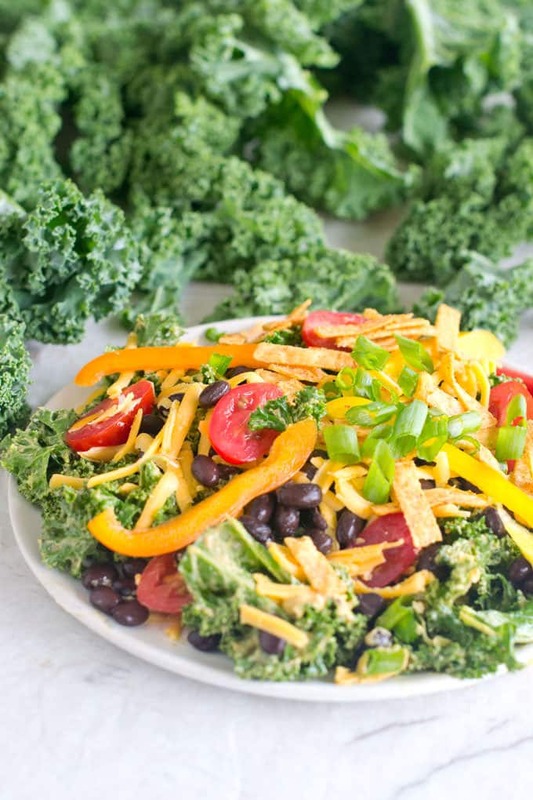 Now we’re putting that skill to use for this Kale Taco Salad. 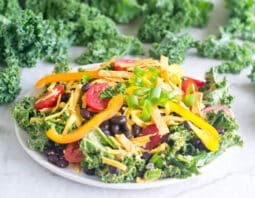 The salad has our favorite taco salad toppings: black beans, green onions, tomatoes, tortilla chips, bell peppers and cheddar cheese. That all goes on top of kale greens that have been massaged to delicious tenderness and then tossed with a really amazing dressing. Ohhhhh this dressing! It’s so creamy smooth and delicious. It’s made in a blender. What you do is scoop in some Greek yogurt and add a whole avocado in there. Then you add lime juice and some of the liquid from a can of chipotle peppers in adobo sauce. Have you tried this stuff? It’s spicy and smoky and adds a ton of killer flavor. Then there’s some chili powder and salt. 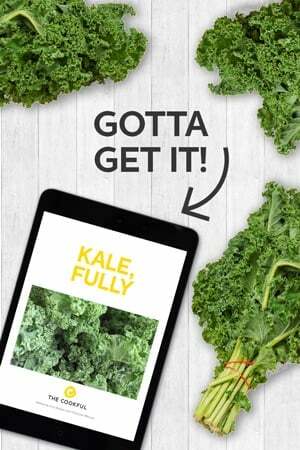 Whiz that up and mix it with your kale leaves. Pile on your toppings and dig in! Yum! In a blender or food processor puree Greek yogurt, avocado, lime juice, adobo sauce, chili powder and ½ teaspoon of salt until smooth. Put kale in a large bowl. Drizzle with olive oil. Massage oil into leaves. Let rest 5 minutes. Add dressing and massage again. Add a pinch of salt. Stir. Divide kale among 4 dinner plates. Top each serving with one quarter of the cheddar cheese, black beans, bell peppers, grape tomatoes, spring onions and taco strips. Disclsoure: I originally developed this recipe for SuperFit Greens. We have permission to share the recipe and photo here but we have not been compensated to do so. All opinions are our own. Sounds yummy! Going to replace the beans (not Keto) with browned ground turkey. The dressing sounds amazing! Thanks for sharing! Thanks Monica. Let me know how it turns out!